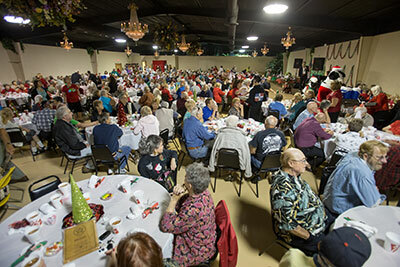 Ever popular Senior Dinner, now in its 19th year, is the only Christmas some area seniors will see. This year your help is needed. Call 813-672-7822. 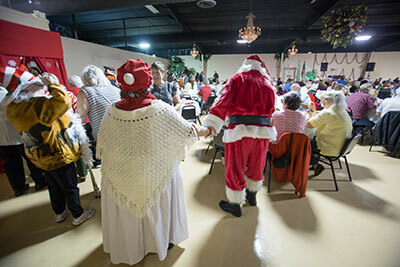 For nearly two decades, many thousands of our community’s seniors have found the spirit of love and Christmas during the annual Senior Dinner. This year, your help is needed to make it happen. Mitch Traphagen photos. On December 10, Barbara Jones of the Hillsborough County Sheriff’s Office Riverview substation will welcome, for the 19th year, an estimated 650 seniors from around South Hillsborough, including people from nursing homes and homeless veterans to the annual Christmas Dinner. For many of those seniors, it will be the only real Christmas event they will attend. It will be their only chance to laugh and smile, to talk with others and share in the Christmas spirit for which the event is so well-known. 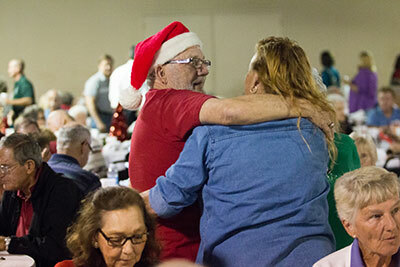 For many, the senior dinner is Christmas. Each senior will enjoy dinner and receive small gifts. It is magical. This year, she has to get even more creative. A major sponsor was unable to help and there is a list of things still needed for the event, which will take place in just two weeks. While she still has incredible support from the community, this year, more than ever, the help of those in the community is needed. Each year, more and more seniors hope to attend the event. Last year 758 people turned out for the dinner, with a number of them unexpected. Jones said that no one complained about the crowding but it was crowded, nonetheless. So this year, she is hoping to hold the line on reservations being made and tickets being required, with a maximum of 650 attendees. She estimates that 150 of those tickets will be reserved for seniors from nursing homes and for homeless veterans. But, of course, it is difficult to turn any one away. And no homeless veteran would ever be turned away. Yes, they are in our community and should be welcomed year-round with open arms, but never more so than at Christmas. Jones sees to that. This event addresses the needs of seniors, which are often forgotten during the holiday season. Many of the seniors are in low-income nursing homes, assisted living facilities and the Meals on Wheels nutrition programs. We are hoping to provide respite care for Alzheimer’s patients, which will allow caregivers a night of welcomed relief. There are numerous seniors within our community without family members, to assist with their financial and emotional needs. It can be a very difficult time of year, to be alone. This is often the only Christmas for many of these individuals. Each year we ask our local merchants and community members to donate items for this event. This year it is even more difficult. We lost a major sponsor of the event. This year we are asking for the community to unite and continue the event. If you can help, call Jones at 813-672-7822. The same number is used for any senior interested in making reservations for the event. Although during much of November the weather has said, “summer,” Christmas is fast approaching. As you sit down and give thanks this week, please considering giving a little bit to help hundreds of seniors in our community enjoy the spirit and love of Christmas. Any gift you can make will be appreciated in ways beyond what can possibly be imagined. Christmas is special. Jones and the many volunteers see just how special it is when a community comes together to make it so.